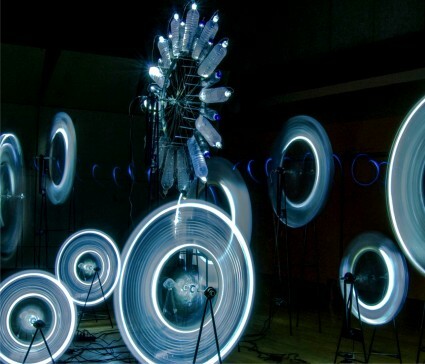 Critically acclaimed International artist Diane Landry-[Quebec], blends the properties of light/shadow and sound, infused with elements of kinetic sculpture, electronics ,and ready-made pieces. Landry’s elegant and ominous installation evokes death and emptiness amid mesmeric continual motion. The forlorn installation juxtaposes a dearth of resources and humankind’s easy distraction by technological objects. Landry is one of Canada’s most prominent artists, holding an MFA from Stanford University California and has shown extensively throughout Canada and Internationally- Landry was a featured artist at the largest Contemporary Canadian Art Exhibition-[Oh Canada] in the world at Mass MoCa USA, and has over 100 exhibitions/performances and in collections worldwide-Europe, USA, China, Mexico, Australia, Argentina….